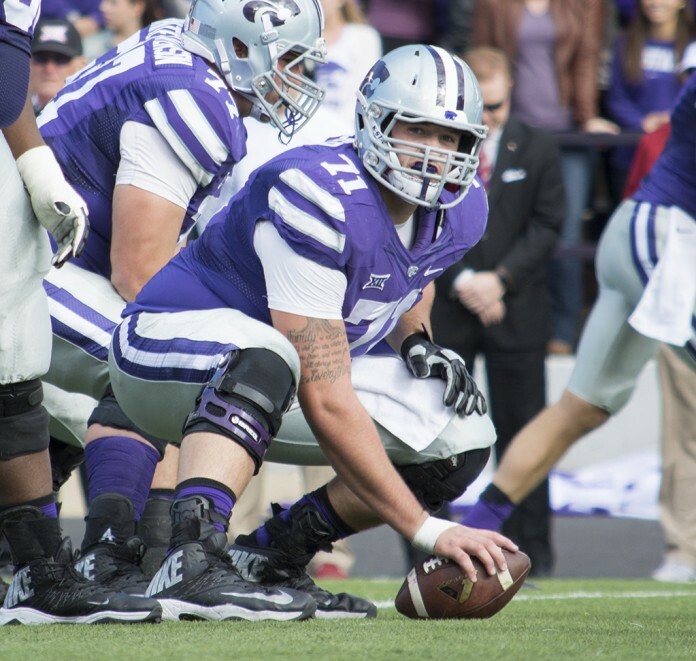 The margin of error for K-State’s bowl hopes has most likely disappeared. The Wildcats have three regular season games remaining and are three wins short of being bowl eligible for the sixth straight year. The Wildcats’ first step toward bowl eligibility starts with Iowa State on Saturday. A win against the Cyclones could shift the tide of six straight losses for the Wildcats, with their most recent coming last week versus Texas Tech in Lubbock, Texas. In a game very familiar to K-State fans this season, the Wildcats let the Red Raiders pop off 28 points in the first quarter while responding with zero points on offense, thus digging a hole that was insurmountable. It was the Wildcats’ fifth loss by 15 points or less this season. Needless to say, K-State coaches and players alike are sick and tired of feeling like they are “almost” there. Even with the fatigue and mental anguish that six straight losses can do to a team’s psyche, Risner said both he and his teammates are still mentally present and will be accounted for in these three final games. “Everyone is on board and everyone keeps talking about how this generation has to have instant self-gratification, and I can say that this team is the opposite of that,” Risner said. According to Risner, the team is nowhere near finished. Iowa State comes into the game Saturday with the lowest talent level the Wildcats have faced since their first three games of the season. That hasn’t stopped the Cyclones, however, from making their presence known in the Big 12 late in the season. Last week, the Cyclones nearly walked away with a win against an Oklahoma State team that is on track to win the Big 12 and land a spot in the College Football Playoffs. Two weeks before, they shut out a Texas team that held K-State to one touchdown and a field goal. Even with Iowa State’s recent successes and near misses, the Cyclones have only looked to take that important next step while at home. Iowa State has not won a road conference game since the final game of the 2013-14 season in which they defeated West Virginia. Meanwhile, K-State has won the last four meetings against Iowa State in Manhattan, and since head coach Bill Snyder returned in 2009, the Wildcats are undefeated against the Cyclones. Kickoff between the Wildcats and Cyclones is set for 11 a.m. at Bill Snyder Family Stadium.